In a bid to widen its footprint across the country, the online pharmacy giant, Netmeds, has taken the franchise route and opened a physical store in Nanded in Maharashtra last year. Netmeds has prepared a five-year plan to achieve a target of opening a minimum of 1,000 stores across India. 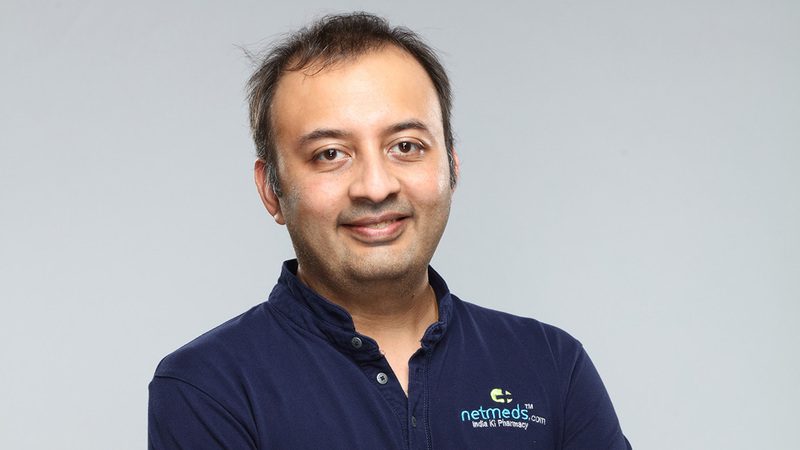 PradeepDadha, Founder and CEO, Netmeds.com, speaks to Franchising World Magazine about the franchising in the pharmacy sector and his future plans for the brand. Given the abundance of pharmacy stores, what made you enter this space? I feel there is enough potential in this sector as it is not getting adequately served. This space is majorly occupied by independent local operators. I decided to move to the brick-and-mortar store so that the people could reap the benefits of an organized and trusted brand. What was the rationale behind launching a physical store despite enjoying an online presence? Today, ‘click-to-brick’ strategy is being embraced by many e-retailer giants. Some adopt this model to provide a better shopping experience for consumers. However, in the pharmacy business, it is more about serving the needs on time. Sometimes, a person needs timely interventions. For instance, a sudden onset of illness requires medicines immediately. Such a person can get the required medicine from a nearby store instead of waiting for the medicines to be delivered at the doorstep. What is the current market size of offline pharmacy? How big is the pharmacy industry? In India, the pharmacy industry is growing at a rate of 15% per annum and is expected to reach $100 billion by 2025. There are around 8 lakh brick-and-mortar pharmacies, the majority of which is skewed toward the tier 1 and 2 cities. How would the Netmeds franchise be profitable for the franchisees? Like any business model or franchise opportunity, the success will be reflective of the thought and planning that’s gone in beforehand, coupled with the dedication and execution skills of the team and the franchisee. With a trusted brand like Netmeds, a store in the right location, and with all superior management, inventory controls and multiple warehouses at their disposal, our franchise partners have an excellent chance of being as successful as us in a microenvironment. What growth opportunities do you see for your brand? Netmeds is already a ‘top-of-mind’ brand in the industry consisting of three or four major players. However, the market share for all the players is less than 1%. So, we have an opportunity to grow, both by putting more space between us and the next closest competitor and by grabbing an even greater share of the overall pharmacy retail spend. How much is the margins in this business (%)? The supply chain and dynamics of the pharmacy industry are in a mature state. Margins are quite competitive with industry standards. However, with the data-driven approach, we plan to reduce a lot of costs involved in the process. This would enhance the profitability of our franchise partners. What are the key requirements for operating a successful franchise? In order to be successful, trust your franchiser, select the right location, work hard and follow the plan given by the franchiser. We are in the industry for more than 100 years now. Besides, we are running one of the largest retail distribution chains in the south. What support or assistance would be provided to franchisees before or during the store opening? The biggest takeaway for our franchise partners is the trust of Netmeds as a brand. We help them with inventory planning, stock keeping and IT infrastructure. In addition to this, we also support them with combined marketing efforts. Also, we are in talks with banks to tie up for disbursement of business loans to eligible applicants; however, the final decision is left to the bank, of course. We are still in the launch stage, where we have invited applications for franchises from across India. The franchise enrolment process is underway and the applicants are being vetted. The 5-year plan for this programme is to achieve a target of opening a minimum of 1,000 stores across the country. What are the most preferred locations for the store? What is the average footfall of the locations being offered? We look forward to a 300 sq. ft. store on the ground floor located at the main road of any neighborhood. With the selection of the right location and stock availability, we expect about 100 footfalls a day. Please tell us about the investment, area, expected ROI and break even. Keeping the above-mentioned requisites as a guideline (300 sq. ft. on the ground floor) on aRs 20 L investment, we have given an indicative break-even period 12-18 months. What kind of input will the franchisees have in marketing and advertising? Branding, communication, designs, content for neighborhood marketing in addition to the centrally driven Netmeds.com umbrella brand marketing are some of the ways in which we will support our franchisees. Serving Highway Food in the Fine Dining..